Note: there is no compilation stage before releasing a CD-ROM course in SuperMemo 99. Indeed, the author can give the students a free hand to expand and/or improve upon the learning material! comprehensive statistics for supervising the learning process including: daily and monthly calendar of repetitions, average number of items to repeat per day, average repetition time, expected number of future repetitions, difficulty distributions, inter-repetition interval distributions, etc. tools for managing the learning process such as: selective memorizing and resetting individual elements, rescheduling outstanding repetitions, etc. element editing tools such as clipboard operations, duplicating elements, etc. collection file management tools such as Copy, Delete, Move, Transfer, Export, Import, etc. fast searching for text substrings, search-and-replace, etc. user-defined degree of attention given to individual elements or entire branches in knowledge tree. By changing the so-called forgetting index, the probability of forgetting for all individual elements can be controlled! 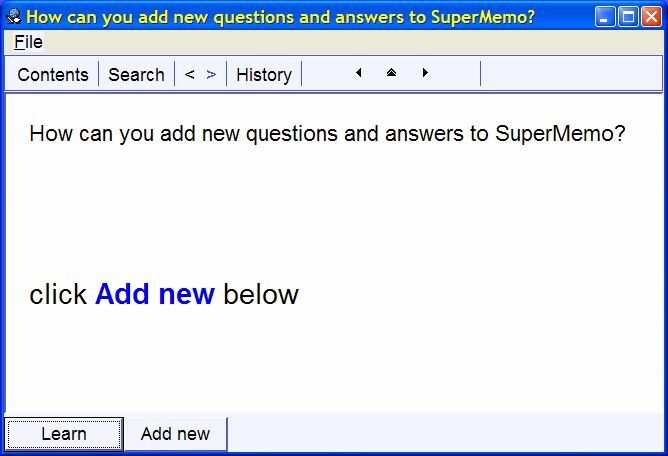 ABC of SuperMemo - see how simple it is at the entry level!